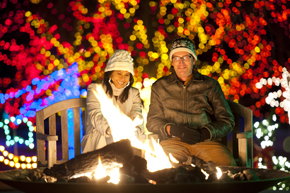 While most blooming plants are dormant for the winter season, the Denver Botanic Gardens creates bountiful manmade bouquets during Blossoms of Light at the York Street location and Trail of Lights at the Gardens at Chatfield from 5:30 to 9:30 p.m. nightly Nov. 29 through Jan. 1. More than 1 million colorful lights are on display at Denver Botanic Gardens and Denver Botanic Gardens at Chatfield throughout the holiday season. At York Street, seasonal entertainment is presented on select evenings. A synchronized holiday light and music showcase illuminates the UMB Bank Amphitheater, and themed gardens enhance the experience. At Chatfield, twinkling lights illuminate a variety of paths throughout Colorado’s countryside; a shorter route takes visitors directly to the children’s play area, while an extended path allows visitors to explore the Green Farm barn and silo before continuing to the children’s area and homestead. Also featured are seasonal entertainment and hayrides are available on select evenings; synchronized music and light showcases; illuminated antique and model tractors and a warming hut and fire pit. Warm drinks, treats and HoloSpex 3-D glasses are available for purchase at both locations.